We enjoyed spotting the handsome cinnabar moth / Tyria jacobaeae which was introduced to America as a biological control agent. It's distinctive orange/black striped larvae have proven to be particularly successful as a biocontrol agent for ragwort when used in conjunction with the ragwort flea beetle in the western United States- according to Wikipedia. The effects of biological controls can inadvertently be detrimental to the native ecological balance which, being delicate and complex, can be hard to predict. Additionally, the spines of the cateperpillar can be irritating and worse if handled. 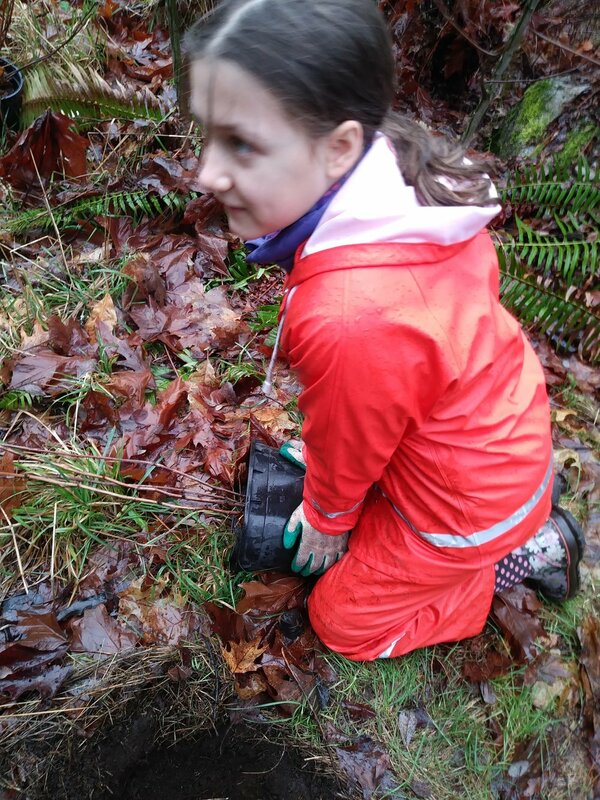 Contributing the the giant restoration task that is refurbishing the old clay pit mine on Cougar Mountain is always a pleasure for the Homeschool Stewardship Squad. Contrary to our last visit, shrouded in heavy cold mist, this beautiful event was a stunner! One could nearly complain about the season's first hot spell while hauling buckets of mulch in the blazing sun. The kids took it in stride, lugging wood chips up and down the hill to create nourishing rings around the baby trees so as to retain soil moisture in the summer as well as to smother weeds. Operating the wheel barrow is naturally a popular task. Watching the mysterious bright red moth flit about was fascinating, I had to look it up (see left). For more information about the clay pit mine, see past posts tagged as such (right). Thanks to King County for hosting us at this fun site. Summertime is upon us, look out for summer work/swim events to start up soon! Water play is a special treat after some stewardship. And our knowledgeable event hosts find us some fantastic swimming holes!